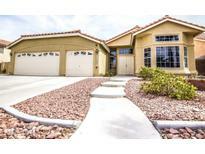 Below you can view all the homes for sale in the Buckingham Estates subdivision located in Las Vegas Nevada. Listings in Buckingham Estates are updated daily from data we receive from the Las Vegas multiple listing service. To learn more about any of these homes or to receive custom notifications when a new property is listed for sale in Buckingham Estates, give us a call at 702-323-5939. !rare Opportunity To Own A 6 Bdr 3000+ Sqft Single Story With Rv Parking And Casita.The Owner Just Spent Over $40k In Upgrades.Upgrades Include New Granite Countertops,New Cabinets,New Paint Inside & Out,Stainless Steel Appliances .Must See To Appreciate.Reviuosly Used For Assisted Living But Also Perfect To Be Used As Primary Residence.Seller To Credit Buyer $10k Towards Flooring Or Closing Costs. MLS#2082168. Compass Realty & Management, L.
It May be Perfect For Assisted Living. Large Backyard! ! MLS#2066226. Realty ONE Group, Inc.